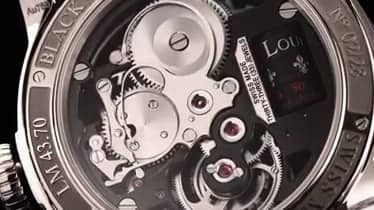 Louis Moinet is one of the world’s most exclusive luxury watch brands, only manufacturing limited editions or unique pieces (500 watches per year). 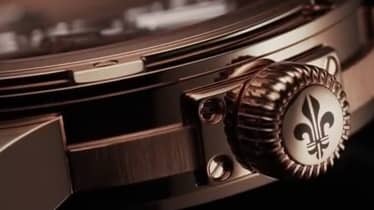 Extraordinary, exotic materials, such as meteorite fragments or fossilized dinosaur bones, enrich these timepieces in a unique way, making each one something incredibly special. Each watch is a combination of traditional craftsmanship and forward-thinking precision technology. Unfortunately, delivery to the USA is not possible at this time. The interstellar inverted double tourbillon with the biggest tourbillon cages in the world. With its spectacular animated dial and skeleton movement, and its extraordinary mechanism. And its exclusive 20-second retrograde mechanism. The roots of this manufacturer reach all the way back to 1806. 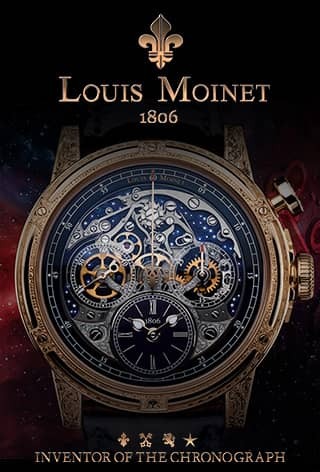 Louis Moinet, a master watchmaker who was one of the greatest watchmaking geniuses of the 19th century, invented the first chronograph in 1816 (certified by Guinness World Records™). He is also the author of Traité d’Horlogerie, an important and celebrated watch encyclopedia published in 1848. Furthermore, he created clocks for the most important people of his time, such as Napoléon Bonaparte, Thomas Jefferson, and King George IV. Each Louis Moinet watch has unique characteristics that make it memorable. Trademarks of the brand include their Gouttes de Rosée hands ending in a dewdrop shape as well as distinctive guilloché patterns on the dial. The brand has developed several animated and spectacular ways to tell time. 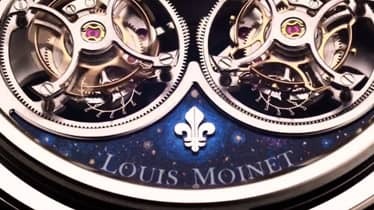 Louis Moinet became the official holder of the title of “World’s First Chronograph Ever,” awarded by the official Guinness World Records organization. Louis Moinet also won some of the most coveted honors, including three Good Design awards, a Red Dot Design award (Best of the Best category), gold and bronze medals in the Chronometry Competition, a Robb Report “Best of the Best” award, a Revolution and Moda Topical award in Russia, a “Chronograph of the Year” distinction from the Japanese magazine Begin, and a UNESCO Award of Merit. Jean-Marie Schaller founded the independent watch company Les Ateliers Louis Moinet SA in 2001 in Saint-Blaise, Switzerland. A watch lover, his goal was to breathe new life into the spirit of the watchmaking genius Louis Moinet. As the CEO and Creative Director, Schaller is responsible for this manufacturer’s exquisite creations. Limited editions emphasize the exclusivity of each Louis Moinet watch.